Google is celebrating what would be Marie Curie's 144th birthday today with a pastel-colored "Doodle" on its homepage. The legendary scientist is pictured working in her shed where she made many discoveries during her lifetime. 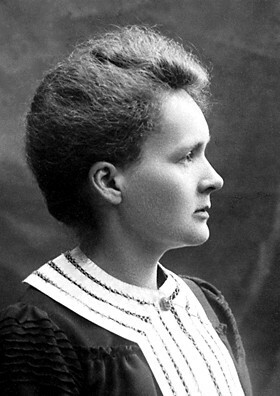 Marie Skłodowska Curie was born in Warsaw, Poland on November 7, 1867. Due to her family's financial problems she was initially unable to attend university, instead training in a laboratory and studying at the Flying University, a secret underground school that defied the ruling by Russian authorities. Eventually she ended up studying at the Sorbonne in Paris, where she obtained Licenciateships in Physics and Mathematical Sciences. She later married her husband Pierre, a Professor at the school of Physics and it was with him that they both discovered radium and polonium, earning them her first Nobel Prize for physics in 1903. Her husband tragically died in a street accident in 1906, and in her grief she continued her work, becoming the first female professor at the Sorbonne and winning a second Nobel in 1911 for Chemistry. Curie is the only person to win a Nobel Prize in two different sciences. A physicist and chemist, she coined the term "radioactivity" to describe the phenomenon discovered by Henri Becquerel. She also developed mobile X-ray units named "Little-Curies" during the First World War. She passed away from radiation exposure in 1934 after prolonged contact with radioactive material over her many years of research. The lab she worked in never had any protective measures in place to contain the radiation, and she often walked around with radioactive isotopes in her pockets, commenting that she enjoyed the way they glowed in the dark. Her obsessive curiosity continued through their daughter, Irène Joliot-Curie and her husband Frédéric Joliot-Curie, who also received a Nobel Prize in 1935 for Chemistry. Curie's legacy lives on today through Marie Curie Cancer Care, a charity bearing her name that fights cancer.